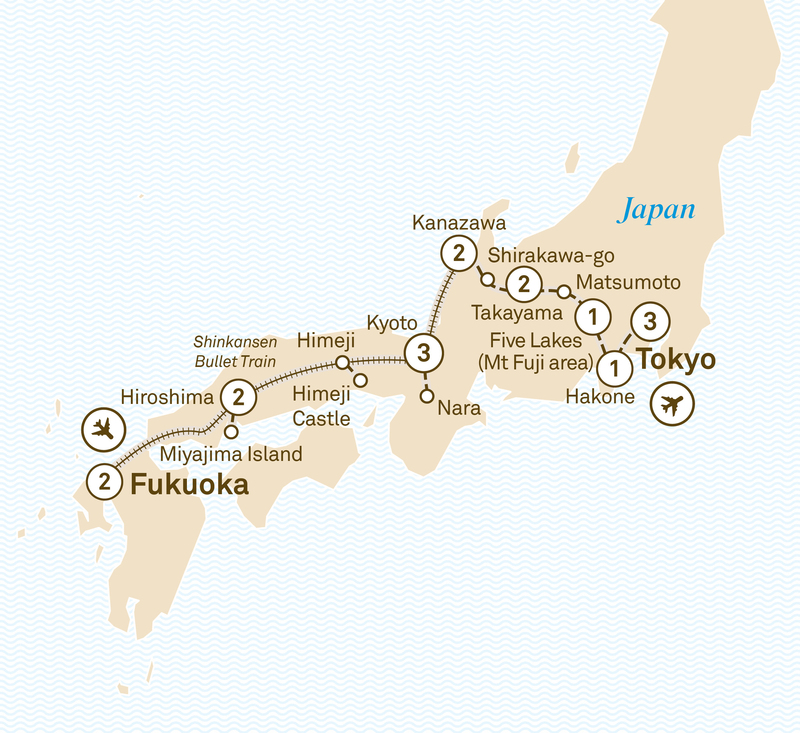 Uncover the Treasures of Japan on this 16 day luxury tour from Fukuoka to Tokyo. Highlights include Himeji Castle, Nara, Kyoto, Takayama and Mount Fuji. From Fukuoka to Tokyo, travel a different path and find those gems hidden away from the regular route. Spend three nights in Kyoto with its World Heritage-listed sites and get to know hidden gems such as Kanazawa, home to one of Japan’s three great gardens and preserved historic districts such as the old homes of the resident Kaga Clan Samurais and visit exotic tea house districts. Similarly, in Takayama and its historic old quarter and cultural relics, enjoy a slower pace of discovery. Marvel at Japan’s natural treasures such as the stunning alpine scenery and traditional homes in Shirakawa-go, visit the Hakone Open Air Museum, and stay in the Kawaguchiko area with views of Mount Fuji and the surrounding lakes. Discover modern metropolises filled with bright neon lights and bustling shopping and entertainment districts, modern robot-filled factories and castles now listed as National Treasures. This 17 day journey will allow you to fully experience Japan’s natural and man-made wonders, both old and new. Enjoy your welcome reception at your luxury hotel in the city centre for the next two nights. Visit Shofuku-ji, the oldest Zen Temple in Japan and the sixth century Kushida Shrine. Next, wander through the Hakata Machiya Folk Museum where you can witness first-hand the prestigious Hakata-ori woven textile being made. Enjoy your afternoon at leisure. Travel by Shinkansen train to Hiroshima. Later, take the ferry to Miyajima Island to visit Daisho-in Temple and the floating sixth century Torii Gate at the Itsukushima Shrine. Tonight, sample Okonomiyaki, a delicious savoury Japanese-style pancake and speciality of the region. Enjoy two nights at Hiroshima. Experience an emotional visit to the Peace Park and Museum before visiting Orizuru Tower to create your own special origami donation. This afternoon, see the industrial robots at work at the Mazda car factory. Travel by Shinkansen to marvel at Himeji Castle, Japan’s most spectacular castle. Continue to Kyoto, home to many World Heritage-listed sites, for a memorable three night stay. Revel in the atmosphere of the ancient preservation districts, or visit the Silver Pavilion and then stroll along the Philosopher’s Walk. Alternatively, visit the Fushimi Inari Shrine, featured in the movie Memoirs of a Geisha and marvel at the architecture of the Nijo Castle. Enjoy an afternoon at leisure to shop or explore. After strolling through the Gion District, tonight’s dinner will allow you to interact with a Maiko who’ll host your meal presentation. It’s an excellent opportunity to learn about what is involved in becoming a Geisha and the art of Japanese hospitality. Enjoy an excursion to Nara to visit Todaiji Temple and Nara Park. Choose between Japanese cuisine at Shinensen Heihachi, or international cuisine at the historic Fortune Garden. Visit the magnificent Kinkaku-ji or Golden Pavilion before travelling to Kanazawa on the Thunderbird Express. Wander around Kenroku–en Garden, one of Japan’s three great gardens located across from Kanazawa Castle Park. Enjoy a two night stay. This morning visit Omi-cho Market, commonly known as Ishikawa’s Kitchen with over 180 stalls. Later catch a glimpse of life in feudal Japan with a visit to former Kaga Clan Samurai houses in the Nagamachi district. Savour the best local Kaga cuisine or enjoy some international fare. Ryokan Upgrade - Choose to stay in a Ryokan, a traditional Japanese Inn with futon beds and private facilities including dinner and breakfast. Must be pre-booked before departure. Travel through beautiful countryside on your way to Takayama, stopping en-route at the famous historical farmhouses of nearby mountain villages in Shirakawa-go, now a World Heritage-listed Site. In Takayama, partake in Sarubobo mascot-making at the Hida Folk Village before your two night stay at your resort with amazing views over the Takayama township. Choose between Le Midi, a French-inspired bistro in town famed for its Hida Beef, or Sakanaya, a fine Japanese restaurant set in a renovated former sake brewery. Stroll through Miyagawa morning markets before gaining unique insights into the region’s culture and history at the Festival Float Exhibition Hall. After lunch, try some sake tasting at a sake brewery and explore the small alleyways and shops of Takayama’s old quarter. Enjoy the remainder of the afternoon and evening at leisure in the historic centre of the town. Drive to the Daio Wasabi Farm to learn how wasabi is made. Continue to Matsumoto to visit one of Japan’s most beautiful and original castles, the unique ‘hirajiro’ style Matsumoto Castle. As you venture deep into the stunning scenery of the Kawaguchiko area, look out for your first view of Mount Fuji. Enjoy an overnight stay. Choose from Japanese or French menus at the hotel restaurant. Discover the incredible workmanship involved in creating kimonos at the Itchiku Kubota Art Museum. Continue to Hakone and cruise on Lake Ashinoko before enjoying a short stroll along the heritage trail after lunch. This evening enjoy a Special Stay overlooking Lake Ashinoko. Study the art works and sculptures at the Hakone Open Air Museum before continuing to Tokyo. Given by Taiko Masters, partake in an interactive, private group demonstration and lesson playing the traditional Taiko drums. Check into your hotel in Tokyo, your wonderful Special Stay for the next three nights. This evening, take in the bright lights of Tokyo during your dinner cruise on Tokyo Bay on a yakatabune, an old fashioned houseboat. Visit the Asakusa district, paying your respects at Sensoji, the city’s oldest Buddhist temple. Visit the Imperial Shinto Meiji Shrine, walk across the busiest pedestrian crossing in the world and see the Hachiko dog statue. Alternatively, visit Shinjuku-Gyoen Gardens before exploring the lively Shinjuku entertainment district, or sample local snacks while strolling through the Yanaka District. Choose contemporary Asian at China Blue. Alternatively, join your Tour Director and immerse yourself in the traditional Japanese evening Izakaya bar scene serving Yakatori and Kushiyaki. Wander through the Tsukiji outer Fish Market to see the morning’s catch being distributed by the wholesale and retail shops. Immerse yourself in Japanese cuisine with the help of a local chef, as you prepare your own sushi lunch. Walk off your lunch in the East Gardens of the Imperial Palace and stop at Ginza for some last minute shopping time. Tonight relive your experiences at your beautiful farewell dinner. Sadly, it is time to bid farewell, taking many wonderful memories with you. From Tokyo to Osaka witness the icons and landmarks of this beautiful country. See Mt Fuji from a cable car, visit the Peace Park at Hiroshima & make sushi.